The Hussite Wars, also called the Bohemian Wars, involved the military actions against and amongst the followers of Jan Hus in Bohemia in the period 1420 to c. 1434. The Hussite Wars were arguably the first European war in which hand-held gunpowder weapons such as muskets made a decisive contribution. The Hussite warriors were basically infantry, and their many defeats of larger armies with heavily armored knights helped effect the infantry revolution. In the end, it was an inconclusive war. Some Hussites embraced pacifism and were not involved in the wars, which they denounced. These Hussites taught that Christians should separate themselves from the state and refuse to fight even for secular rulers, since Christians must always practice love. Critics of religion point to the Hussite Wars and to others conflicts that appear to have been religiously motivated to claim that religion is a negative aspect of human life, often the cause of violence, division, and oppression. Religious people, they argue, assert exclusive truth claims and try to compel others to conform to their beliefs. Throughout history, some people of faith have engaged in armed struggle. However, the Hussites merely wanted the freedom to practice what they believed; it was the state that restricted this. The Hussites, too, were not purely motivated by religion; their movement was closely linked with the Czech people's desire to assert their national identity and independence. As humanity matures, realizing the value of religious freedom alongside other freedoms and human rights, many people of faith regret that their predecessors engaged in so many wars, instead of championing peace as the highest ideal. The Hussite movement assumed a revolutionary character as soon as the news of the execution of the proto-Protestant reformer Jan Hus by order of the Council of Constance July 6, 1415) reached Prague. The knights and nobles of Bohemia and Moravia, who were in favor of church reform, sent a protest to the Council of Constance on (September 2, 1415), known as the protestatio Bohemorum, which condemned the execution of Hus in the strongest language. The attitude of Sigismund, Holy Roman Emperor, who sent threatening letters to Bohemia declaring that he would shortly drown all Wycliffites and Hussites, greatly incensed the people. Trouble broke out in various parts of Bohemia, and drove many Catholic priests from their parishes. Almost from the first the Hussites divided into two groups, though many minor divisions also developed among them. Shortly before his death Hus had accepted a doctrine preached during his absence by his followers at Prague, namely that of Utraquism, or the obligation of the faithful to receive communion in both kinds, bread and wine. (sub utraque specie). This doctrine became the watchword of the moderate Hussites known as the Utraquists or Calixtines, from the Latin calix (the chalice), in Czech kališníci (from kalich); while the more extreme Hussites soon became known as the Taborites (táborité), named after the city of Tábor that became their center; or Orphans (sirotci) a name they adopted after the death of their beloved leader and general Jan Žižka. The Utraquists hoped to be reconciled with Rome; the Taborites had no such expectation. Later, the Unitas Fratrum emerged, attracting members from both but embraced pacifism, becoming a peace-church. Under the influence of his brother Sigismund, King Wenceslaus IV of Bohemia endeavored to stem the Hussite movement. He did so for political reasons; his ambition to be crowned as Emperor meant that his own kingdom had to be Catholic. Initially, he had protected Hus but later changed policy. A certain number of Hussites led by [[Nicolas of Hus]—no relation of Jan Hus, though of the same town—left Prague. They held meetings in various parts of Bohemia, particularly at Sezimovo Ústí (not to be confused with Ústí nad Labem), near the spot where the town of Tábor was founded soon after. At these meetings, they vehemently denounced Sigismund. Their supporters prepared for war. The wars were also a protest against the German aristocracy, the power of the monarchy and of the church, an expression of Czech "national identity." Although many prominent Hussites had now left Prague, troubles continued. On July 30, 1419, when a Hussite procession headed by the priest Jan Želivský marched through the streets of Prague, anti-Hussites threw stones at the Hussites from the windows of the town-hall of the "new town." The people, headed by Jan Žižka, threw the burgomaster and several town-councilors, who had instigated this outrage, from the windows (the first "Defenestration of Prague"). The crowd killed them immediately. King Wenceslaus died of natural causes a few days later (August 16 1419). The king's death resulted in renewed unrest in Prague and in many other areas of Bohemia. Many Catholics, mostly Germans—for they had almost all remained faithful to the papal cause—suffered expulsion from the Bohemian cities. In Prague, in November 1419, severe fighting took place between the Hussites and the mercenaries whom Queen Sophia (widow of Wenceslaus and regent after the death of her husband) had hurriedly collected. After a considerable part of the city had been destroyed, the parties declared a truce on November 13. The nobles, though favorable to the Hussite cause, supported the regent and promised to act as mediators with Sigismund, while the citizens of Prague consented to restore to the royal forces the castle of Vyšehrad, which had fallen into their hands. Žižka, who disapproved of this compromise, left Prague and retired to Plzeň. Unable to defend himself there he marched to southern Bohemia, and after defeating the Catholics at the battle of Sudoměř (March 25, 1420) in the first pitched battle of the Hussite wars, he arrived at Usti, one of the earliest meeting-places of the Hussites. Not considering its situation sufficiently strong, he moved to the neighboring new settlement of the Hussites, called by the biblical name of Tábor. Tabor soon became the center of the Taborites, who differed from the Utraquists by recognizing only two sacraments—Baptism and Communion—and by rejecting most of the ceremony of the Roman Catholic Church. The ecclesiastical organization of Tabor had a somewhat puritanical character, and the government was established on a thoroughly democratic basis. Four captains of the people (hejtmané) were elected, one of whom was Žižka; and a very strictly military discipline was instituted. Depending on the terrain, Hussites prepared carts for the battle, forming them into squares or circles. The carts were joined wheel to wheel by chains and positioned aslant, with their corners attached to each other, so that horses could be harnessed to them quickly, if necessary. In front of this wall of carts a ditch was dug by camp followers. 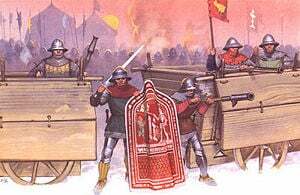 The crew of each cart consisted of 16-22 soldiers: 4-8 crossbowmen, 2 handgunners, 6-8 soldiers equipped with pikes or flails (the flail was the Hussite "national weapon"), 2 shield carriers and 2 drivers. The Hussites' battle consisted of two stages, the first defensive, the second an offensive counterattack. In the first stage the army placed the carts near the enemy army and by means of artillery fire provoked the enemy into battle. The artillery would usually inflict heavy casualties at close range. In order to avoid more losses, the enemy knights finally attacked. Then the infantry hidden behind the carts used firearms and crossbows to ward off the attack, weakening the enemy. The shooters aimed first at the horses, depriving the cavalry of its main advantage. Many of the knights died as their horses were shot and they fell. As soon as the enemy's morale was lowered, the second stage, an offensive counterattack, began. The infantry and the cavalry burst out from behind the carts striking violently at the enemy—mostly from the flanks. While fighting on the flanks and being shelled from the carts the enemy was not able to put up much resistance. They were forced to withdraw, leaving behind dismounted knights in heavy armor who were unable to escape the battlefield. The enemy armies suffered heavy losses and the Hussites soon had the reputation of not taking captives. 2. The sacrament of the most Holy Eucharist shall be freely administered in the two kinds, that is bread and wine, to all the faithful in Christ who are not precluded by mortal sin—according to the word and disposition of Our Savior. 4. All mortal sins, and in particular all public and other disorders, which are contrary to God’s law shall in every rank of life be duly and judiciously prohibited and destroyed by those whose office it is." These articles, which contain the essence of the Hussite doctrine, were rejected by Sigismund, mainly through the influence of the papal legates, who considered them prejudicial to the authority of the Roman see. Hostilities therefore continued. Though Sigismund had retired from Prague, the castles of Vysehrad and Hradcany remained in possession of his troops. The citizens of Prague laid siege to the Vysehrad (see Battle of Vysehrad), and towards the end of October (1420) the garrison was on the point of capitulating through famine. Sigismund attempted to relieve the fortress, but was decisively defeated by the Hussites on 1 November near the village of Pankrác. The castles of Vysehrad and Hradcany now capitulated, and shortly after this almost all Bohemia fell into the hands of the Hussites. Internal strife prevented the followers of Hus from fully capitalizing on their victory. At Prague a demagogue, the priest Jan Zelivsky, for a time obtained almost unlimited authority over the lower classes of the townsmen; and at Tabor a religious communistic movement (so-called Adamites) was sternly suppressed by Žižka. Shortly after a new crusade against the Hussites was undertaken. A large German army entered Bohemia and in August 1421 laid siege to the town of Zatec. After an unsuccessful attempt of storming the city, the crusaders retreated somewhat ingloriously on hearing that the Hussite troops were approaching. Sigismund only arrived in Bohemia at the end of the year 1421. He took possession of the town of Kutná Hora but was decisively defeated by Jan Žižka at the battle of Nemecky Brod (Deutschbrod) on January 6, 1422. Bohemia was for a time free from foreign intervention, but internal discord again broke out, caused partly by theological strife and partly by the ambition of agitators. Jan Želivský was on March 9 1422 arrested by the town council of Prague and decapitated. There were troubles at Tábor also, where a more advanced party opposed Žižka's authority. Bohemia obtained a temporary respite when, in 1422, Prince Sigismund Korybut of Lithuania (nephew of King Władysław II Jagiełło of Poland) briefly became ruler of the country. He was a governor sent by the Grand Duke of Lithuania, Vytautas, who accepted the Hussite proposal to be their new king. His authority was recognized by the Utraquist nobles, the citizens of Prague, and the more moderate Taborites. Sigismund Korybut, however, remained a short time in Bohemia, as in 1423 he was called to come back to Lithuania, after Jagiello had made a treaty with Sigismund. On his departure, civil war broke out when the Taborites took to arms against the more moderate Utraquists, who at this period are also called the "Praguers;" Prague was their principal stronghold. On April 27, 1423, Žižka now again leading, the Taborites defeated the Utraquist army under Čeněk of Wartenberg at the battle of Horic. An armistice was concluded at Konopilt. Papal influence had meanwhile succeeded in launching a new crusade against Bohemia, but it resulted in complete failure. In spite of the best efforts of their rulers, Poles and Lithuanians did not wish to attack their kindred Czechs; the Germans were prevented by internal squabbles from taking joint action against the Hussites; and the King of Denmark, who had landed in Germany with a large force intending to take part in the crusade, soon returned to his own country. Free for a time from foreign aggression, the Hussites invaded Moravia, where a large part of the population favored their creed; but, paralyzed again by dissensions, they soon returned to Bohemia. The city of Hradec Králové, which had been under Utraquist rule, espoused the doctrine of Tabor, and called Žižka to its aid. After several military successes gained by Žižka in 1423 and the following year, a treaty of peace between the Hussites was concluded on September 13, 1424 at Liben, a village near Prague, now part of that city. In 1426, the Hussites were again attacked by foreign enemies. In June of that year their forces, led by Prokop the Great—who took the command of the Taborites shortly after Žižka's death in October 1424—and Sigismund Korybut, who had returned to Bohemia, signally defeated the Germans at Usti nad Labem. After this great victory, and another at the Battle of Tachov in 1427, the Hussites repeatedly invaded Germany, though they made no attempt to occupy permanently any part of the country. From 1421 to 1427 the Hussites received military support from the Poles. Poland, though a devoutly Catholic nation, was supporting the Hussites on non-religion grounds. Poland's motive was revenge against Germany for the Polish-Lithuanian-Teutonic War (1409-1411). Because of this, Jan Žižka arranged for the crown of Bohemia to be offered to Jagiello, the King of Poland, who, under pressure from his own advisers, refused it. The crown was then offered to Grand Duke Vytautas of Lithuania and Vytautas accepted it, with the condition that the Hussites reunite with the Catholic Church. In 1422, Žižka accepted the Polish king's nephew, Sigismund Korybut, as regent of Bohemia for Vytautas. Korybut never managed to return the Hussites to the Catholic Church; and he even had to resort to force of arms when dealing with the various factions. Korybut did not tolerate the Protestant rebels breaking their promise of reuniting with the Catholic Church. On a few occasions, he even fought against both the Taborites and the Oreborites to try to force them into reuniting. Large scale Polish involvement was ended in 1427 when Korybut was arrested by the Hussites after Polish plans to hand over the Hussite forces to Emperor Sigismund were discovered. The Poles, however, did not really want to withdraw; the only reason they did is because the Pope planned to call a crusade against Poland if they did not. Spanilé jízdy, or beautiful rides, as the Hussites called them, were undertaken in many different foreign lands. Throughout the Hussite Wars, especially under the leadership of Prokop the Great, invasions were made into Silesia, Saxony, Hungary, Lusatia, and Meissen. Every raid that the Hussites carried out was against a country that had supplied the Germans with men during the anti-Hussite crusades. These raids were made to try to strike enough fear in these areas to make sure that they would not help out the Germans again. However, the raids did not have the desired effect; these countries kept supplying soldiers to the crusade against the Hussites. During yet another war between Poland and the Monastic State of the Teutonic Knights, some Hussite raiders helped the Poles. In 1433, a Hussite army of 7000 fighting men marched through Neumark into Prussia and captured Dirschau on the Vistula River. They would eventually reach the mouth of the Vistula where it enters the Baltic Sea near Danzig. There, they performed a great victory celebration to show that nothing but the ocean could stop the Hussites. The Prussian historian Heinrich von Treitschke would later write that they had "greeted the sea with a wild Czech song about God's warriors, and filled their water bottles with brine in token that the Baltic once more obeyed the Slavs." The almost uninterrupted series of victories of the Hussites led many to realize that they were of not going to defeat them by force of arms. Also, the conspicuously democratic character of the Hussite movement caused the German princes, who were afraid that such views might extend to their own countries, to desire peace. Many Hussites, particularly the Utraquist clergy, were also in favor of peace. Negotiations for this purpose were to take place at the ecumenical council which had been summoned to meet at Basel on March 3, 1431. The Roman See reluctantly consented to the presence of heretics at this council, but indignantly rejected the suggestion of the Hussites that members of the Greek Church, and representatives of all Christian creeds, should also be present. Before definitely giving its consent to peace negotiations, the Roman Church determined on making a last effort to defeat the Hussites. On August 1, 1431 a large army of crusaders under Frederick, Margrave of Brandenburg, whom Cardinal Cesarini accompanied as papal legate, crossed the Bohemian border and on 14 August the crusaders reached the town of Domažlice. When the Hussite army arrived, reinforced with some 6000 Polish Hussites and under the command of Prokop or—as the legend has it—upon seeing the Hussite banners and hearing their battle hymn "Kdož jsou Boží bojovníci" ("Ye Who are Warriors of God"), the crusaders immediately took to flight. On October 15, the members of the council, already assembled at Basel, issued a formal invitation to the Hussites to take part in its deliberations. Prolonged negotiations ensued; but finally a Hussite embassy, led by Prokop and including John of Rokycan, the Taborite bishop Nicolas of Pelhrimov, the "English Hussite" Peter Payne and many others, arrived at Basel on January 4, 1433. It was found impossible to reach an agreement. Negotiations were not, however, broken off, and a change in the political situation of Bohemia finally resulted in a settlement. In 1434, war again broke out between the Utraquists and the Taborites. On May 30 of that year the Taborite army, led by Prokop the Great and Prokop the Lesser, who both fell in the battle, was totally defeated and almost annihilated at Lipany. An end to the Polish Hussite movement in Poland would arrive as well: the Polish Hussites, often reinforced by their Czech Slav brethren, had been raiding there for years, and the royal Polish forces under Władysław III of Varna would defeat the Hussites at the Battle of Grotniki, bringing the Hussite Wars to an end. I. The Holy Sacrament is to be given freely in both kinds to all Christians in Bohemia and Moravia, and to those elsewhere who adhere to the faith of these two countries. 2. All mortal sins shall be punished and extirpated by those whose office it is so to do. 3. The word of God is to be freely and truthfully preached by the priests of the Lord, and by worthy deacons. 4. The priests in the time of the law of grace shall claim no ownership of worldly possessions. On July 5, 1436, the compacts were formally accepted and signed at Jihlava, in Moravia, by King Sigismund, by the Hussite delegates, and by the representatives of the Roman Catholic Church. The last-named, however, refused to recognize as archbishop of Prague John of Rokycan, who had been elected to that dignity by the estates of Bohemia. The Utraquist creed, frequently varying in its details, continued to be that of the established church of Bohemia until all non-Catholic religious services were prohibited shortly after the Battle of the White Mountain in 1620. The Taborite party never recovered from its defeat at Lipan, and after the town of Tabor had been captured by George of Podebrady in 1452, Utraquist religious worship was established there. The Bohemian brethren, whose intellectual originator was Petr Chelčický but whose actual founders were Brother Gregory, a nephew of Archbishop Rokycan, and Michael, curate of Zamberk, to a certain extent continued the Taborite traditions, and in the fifteenth and sixteenth centuries included most of the strongest opponents of Rome in Bohemia. J. A. Komensky (Comenius), a member of the brotherhood, claimed for the members of his church that they were the genuine inheritors of the doctrines of Hus. After the beginning of the German Reformation many Utraquists adopted to a large extent the doctrines of Martin Luther and of John Calvin; and in 1567 obtained the repeal of the compacts, which no longer seemed sufficiently far-reaching. From the end of the sixteenth century the inheritors of the Hussite tradition in Bohemia were included in the more general name of "Protestants" which they shared with other supporters of the Reformation. histories of Bohemia devote a large amount of space to the Hussite movement. Some critics of religion point to conflicts such as the Hussite Wars to claim that religion is a negative aspect of human life, often the cause of violence, division and oppression as some attempt to compel others to adopt their beliefs and practices. Throughout history, people of faith have engaged in armed struggle. Yet throughout history, others have denounced violence The Hussites merely wanted the freedom to practice what they believed and in choosing to defend this by military means they were not purely motivated by religion; the Hussite movement was closely linked with the Czech people's desire to assert their national identity and independence. As humanity matures, realizing the value of religious freedom alongside other freedoms and Human rights, many people of faith regret that their predecessors engaged in so many wars, stressing instead that peace is the highest ideal. In 1457, some Hussites formed the Unitas Fratrum, later also known as the Moravians, who embraced the principle of peace and rejected war. They followed the teachings of Peter Chelchicky an early disciple of Hus, who rejected violence and advocated a return to Jesus Christ Jesus' simple life-style. Chelchicky said that if people refused to fight, the princes would have no army. He argued that true Christianity was separate from the state, and had no recourse to the sword. Constantine I had corrupted the Church by making it a tool of the Roman state. Christians are "only obligated to follow the law of love." He went so far as to argue that Christians are called to practice absolute pacifism and to endure persecution rather than take to the sword. He had been attracted by the Taborites but rejected their violence. The Sermon on the Mount was the Community's favorite text. Some people of faith may defend use of arms in certain, limited circumstances. However, the fact that religious people have used violence in the past does not mean that they were always right to do so, or that religion was always their major motivation. In situations where religion is allied with or subservient to the state, it is likely to be one of several causes for conflict, rather than the main or only cause. ↑ Turnbull and McBride (2004), back cover. ↑ The Encyclopedia Britannica; a Dictionary of Arts, Sciences, Literature and General Information (Encyclopedia Britannica), 8. ↑ Turnbull and McBride (2004), 15. Atwood, Craig D. 2004. Community of the Cross: Moravian Piety in Colonial Bethlehem. Max Kade German-American Research Institute series. University Park, PA: Pennsylvania State University Press. ISBN 9780271023670. Crews, C. Daniel. 2008. Faith, Love, Hope: A History of the Unitas Fratrum. Winston-Salem, NC: Moravian Archives. ISBN 9780971941137. Housley, Norman. 2002. Religious Warfare in Europe, 1400-1536. Oxford, UK: Oxford University Press. ISBN 9780198208112. Louthan, Howard. 1997. The Quest for Compromise: Peacemakers in Counter-Reformation Vienna. Cambridge studies in early modern history. Cambridge, UK: Cambridge University Press. ISBN 9780521580823. Přenosil, Jiří. 2002. The Czech Contribution to Peace and War in Europe: From the Hussite Wars to NATO Membership. Prague, CZ: Evropský Literární Klub. ISBN 9788086316390. Turnbull, Stephen R., and Angus McBride. 2004. The Hussite Wars, 1419-36. Men-at-Arms. Oxford, UK: Osprey. ISBN 9781841766652. Joan of Arc's Letter to the Hussites (23 March 1430) — In 1430, Joan of Arc dictated a letter threatening to lead a crusading army against the Hussites unless they returned to "the Catholic Faith and the original Light." This link contains a translation of the letter plus notes and commentary. This page was last modified on 20 January 2018, at 16:43.